Respondents subscribe to your panels, and become panel members, by answering your surveys. With segments you can group your respondents in two different ways. **NOTE: Surveybot Workplace users will only be able to segment employees who are already in Surveybot. The videos below shows you how that's done. Prefer reading? Just scroll down. Navigate to "Panels" from the top menu. 2. Find the Panel you want to segment and click on the name. 3. Select "New segment" then "Create a segment" from the dropdown. 4. Select the match type for your segment conditions. "all" means that every condition must be met and "any" means that only one condition must be met. Now we'll step your through each of the different ways that you can add conditions to build your segment. Profile attributes are data fields that are stored in the panel respondent profiles. Surveybot provides a set of default fields but you can also create your own custom fields for your panels. 1. To create your condition, first select the "Attribute" from the dropdown. 2. Select the match type for your condition from the next dropdown. 3. Enter a match value in the text field. 4. To add another Profile attribute condition click "Add another condition" and repeat steps 1 - 3. Here's how you can add conditions to segment your panel based on answers to specific questions in previous survey responses. 1. Select a Survey from the first dropdown. 2. 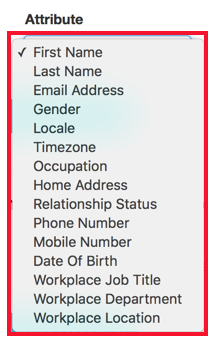 Having selected a survey, select a question from the second dropdown. 3. Select the match type for your condition from the next dropdown. 4. 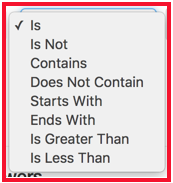 Enter a value to match in the text field for your condition. 5. To add another Previous question answer condition click "Add another condition" and repeat steps 1 - 4. Here's how to segment your panel based on the responses to previous surveys they've done. 1. Select the survey you want to segment your condition from. 2. Select if you want to segment the responses by "Is Complete" or "Is not Complete" responses. 3. To add another Previous survey response condition click "Add another condition" and repeat steps 1 - 2.